We had to move the Panhard rod. Someone�we're not saying who�thought it would be a good idea to keep the bar as horizontal as possible, so that any up or down movement wouldn't shift the axle sideways very much. Which is a totally justified and defensible decision. 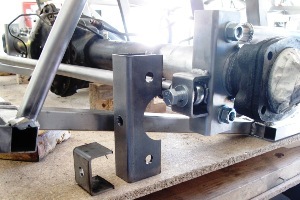 However, because the nearside Panhard rod bracket is mounted low on the frame, and the offside attachment to the axle is correspondingly low, the bottom of the rod turns out to be an eighth of an inch lower than the bottom of the axle. 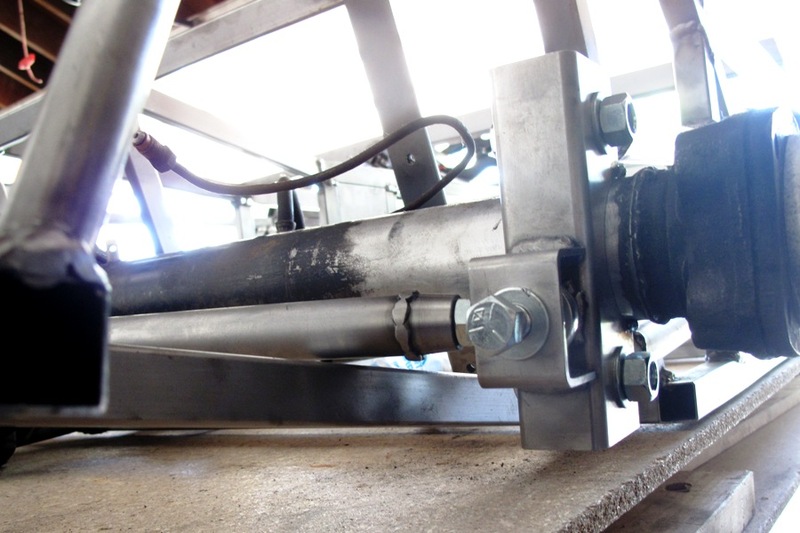 The RU tubes already limit axle droop to barely 2". A lower Panhard rod reduces this clearance even further. Of course, you might say 1/8" is no big deal, and ordinarily we'd agree with you, but it gets worse. The Panhard rod is about 2" behind the axle, and the RU tubes slope upward to the back. Which means the Panhard rod hits the RU tube when the axle still has over half an inch to go. 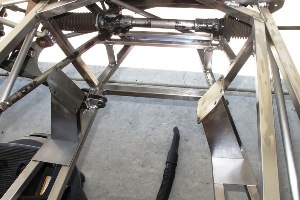 So with the Panhard rod level, offside droop is limited to less than 1-1/2". That's not nearly enough. It wouldn't work at all in Tetre Rouge, or for that matter most other right-hand turns. So we have to move the rod, raising its attachment point on the axle bracket. In situations like this, we always want to know our options. The most obvious would be to cut the old attachment off, drill a hole 3/4" higher, and weld on a new attachment. This would be a lot of work, and also a huge mess, because we'd not only have to remove the channel section behind the bracket, but our welded-on cone spacer too. Our second option, which we thought was actually sort of clever, would be to flip the axle bracket around. It's only tack welded on. Flipping it around would place the Panhard rod attachment 1" above the bracket centerline, instead of 1" below, where it is now. According to our calculations, this would raise the attachment 2". Unfortunately, as we've noted in the past, clever doesn't really work for us, and while option 2 sounds like a pretty exciting solution, in the end we would not be happy with the Panhard rod mounted that high. For one thing it would look funny. People would ask about it, and we'd have to admit we'd made a huge mistake. For another thing, it would be almost impossible to get a nut all the way up there, with the shock mount welded on. But mostly we just want to make the car the right way, do the best job we can. Tilting the Panhard rod 3/4" at one end is a lot better than tilting it 2". So we're going with option 3, which we always seem to do. We're going to make a brand new axle bracket. We have enough leftover tubing, and we can cut the pieces out a lot faster now with our angle grinder. So it really isn't all that painful, except for making six new cone spacers using our lathe-free method, which takes about two hours per, if we're lucky. So far we've cut all the parts and drilled the holes, and all that's left is finishing the ends and welding it together. Overall not much of a setback. We're sure you'll all be a lot happier with the result. Still, it's been a little discouraging lately with all the do-overs. I asked a fellow Locost builder, a gentleman who's already built two Locosts and is on his third, at what point you stop finding mistakes in the build. I was afraid his answer would be not until you finish the car. But actually he said it wouldn't be until you'd finished the car, driven several thousand miles, gotten tired of working on the thing, and sold it. Then, after the new owner loses your phone number, you stop finding mistakes in the build. I'm not sure if any of this was supposed to make us feel better. It didn't. Our list of welding tasks is winding down. We welded the steering column support plate to the scuttle frame, and started welding the motor mounts together. As per our usual practice, we're going to use actual donor parts as a jig for welding the motor mounts to the frame, which in this case is the motor, so that's not going to happen anytime soon. But all the frame brackets are done, and all we have to do before we paint the frame is weld in the floor. We also have to close off all the open tube ends with little squares of 16-gauge steel. That shouldn't take more than a couple of days.